It’s almost time for NaNoWriMo, when thousands of writers will try to cram 50,000 words into a 30-day deadline. 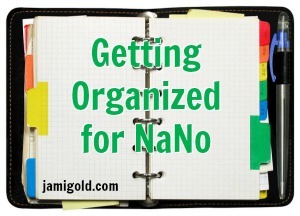 If you’re participating in NaNo and anything like me, you might be freaking out a little as November nears. Unfortunately, my health issues this year mean that I can’t present Lost Your Pants? as a live class. As part of the months-long waiting period for my jawbone infection to heal, my doctor decided to wrangle my jaw into shape with posts and rubber bands holding it together in ten places, and they won’t be off for at least several more weeks. I’ve never offered this workshop OnDemand because it’s a complex class to organize: two webinar sessions (which are each about two hours long) and lots of exclusive materials and downloads. Do you write by the seat of your pants? Do you want to write faster? Learn techniques and receive tools developed especially for pantsers. I jokingly refer to this workshop as my “plotting for pantsers” class, but it’s really about how to plan our stories at a high level and work our way down only as much as we need to. Whether we’re a “pantser” (writing by the seat of our pants) who just wants to learn a minimalist approach to story development, or a plotter who wants to understand how plot and character arcs work together, this class might be able to help. Everyone who registers will receive several tools (worksheets and beat sheets) developed especially for the workshop. Also, for NaNo preparation, the tools help writers work out enough story direction to make “fast drafting” techniques work for us. I won’t be offering this workshop again until next year, so if you’ve thought about taking the class, you might want to grab this opportunity. Planning Smart: We don’t want to spend hours working through a character background sheet if we’re good at winging the character aspect of our story. Alternately, we don’t want to waste time completing a story outline if we’re good at making up the plot turning points as we go. Learn what style of planning will work best for us. Essential Elements of a Story: Does our story contain all the essential elements? Does it have the bones of a good story? Learn what elements we need for our story to be strong, have a purpose and an arc, and how we can make it even better. Finding the Start of Our Story: What should the starting point of our story be? What opening scene will best get across the right impression, lead to the rest of the story, and grab readers’ interest? Learn what story opening might work best and an alternate approach for figuring out the best story beginning. Build Arcs & Don’t Get Stuck: What should we do if we get stuck in our plot? Or with our character? How do we develop a character arc? How can we avoid a “sagging middle”? Nitpicky Issues that Can Wait for Revisions: Should our protagonist be on the first page? Should we avoid prologues? What about first-page clichés? Are you participating in NaNo this year? (Are we buddies yet?) What are you working on for NaNo? What’s your top NaNo tip? Do you have any questions about my workshop or what it means that it’s OnDemand rather than live? NaNo Prep: Are You Ready to Start Drafting? I’m nowhere near as organised as I should be. I have officially signed up for this year although I still have doubts whether I’ll be successful this time. I’ve joined my regional NaNo group and met them for the first time a couple of weeks ago which was really cool 🙂 From this Sunday on we’re going to meet every week for write ins and hopefully with us all supporting each other, we’ll all make it past 50k! LOL! For all my organization on putting these links together, I have no idea what I’m actually going to write. I know the heroine, have a vague idea for the hero, and sort of know the first scene…and that’s it? That said, I do not emphasize winning when I participate. I mean I have won before, so it’s not that I don’t try. I just figure that focused time for writing is good and every word we write is one we didn’t have before. 😀 Good luck to you! Quick question about the class. This is different than the Beat Sheet class, right? I realize it may have some of the same material. Hope you are feeling much better as the year goes on. Praying for you. Well, I would appreciate it if you would sent to me the link/password. Thanks. Probably do good for me to review the material. All these links! Thank you, Jami. Sorry but I’m still mostly a pantser. However, when doing the rewrite, most, if not all, of these links are going to stop me from drowning. I know how to copy edit, but the rest is pure mystery to me. Because I live on a short skinny shoe string, any editing I can do myself must be done before sending the manuscript off to someone I’ll have to pay. Again, thank you! Like you, I tend to do a lot more of this thinking during revisions, and it’s always good to be able to save money by self-editing as much as we can. As I mentioned to Lara above, I don’t really have much “prepared” for NaNo this year, so I understand. 😉 Thanks for the comment! Aww, thanks for the feedback! I’ve learned not to stress too much about “winning” NaNo, so that helps too. 🙂 Thanks for the comment! I don’t do this but good wishes to all writers. Happy healing, Jami, hope the jaw feels better soon!